If I served this poached salmon to my family in Israel, they would be certain I had lost my marbles. Not that they don't think so already, but this innocently swimming wild Coho, that was sacrificed for the sake of holiday symbolism, would seal the deal and I would be shipped off to an asylum. In comparison to my family's full of punch Indian and Israeli table, this poor little Coho fellow would be considered anemic. I thought so too years ago, until I developed the idiosyncrasies and appreciation for the delicately subdued. When moving to the US, I was not prepared for the stripped down ingredients with minimal handling and seasoning. At the time, to me it tasted bland, and I didn't think of the technique or much needed handling with care that goes into the dish. I would totally discount it and turn my nose up. The little I had known that it is such a delicacy. 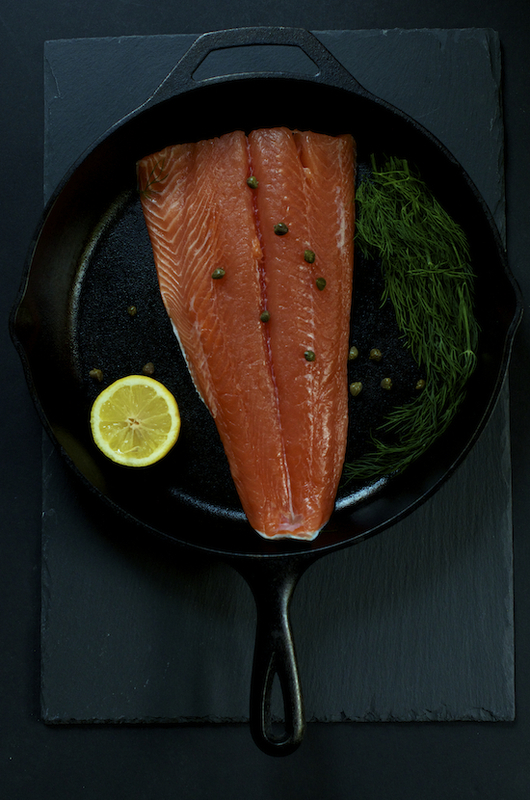 For years, I would never touch that mandatory, to me, Ashkenazi (Eastern European Jewish) poached salmon on Rosh HaShanah, the Jewish New Year, when we were guests elsewhere. I have steamed salmon before in a bamboo basket but never poached it. It was still an epic steamed disaster. I have successfully poached duck in duck fat for duck confit on several occasions but had never, you guessed it, poached salmon before. I grew to love it even if it was not love at first sight. What motivated me to write about it is my instant spark for lemony dill aioli and the upcoming holidays. Symbolically a whole fish is served head to tail on Rosh HaShanah, the Jewish New Year, to remind us, we all should aspire to be leaders like the head and not followers like a tail. More often than not, nowadays, you will see only fillets served, as some get queasy stomachs at the sight of a whole fish. While baking is considered more of a science, there are scientific elements to poaching, especially with olive oil. I knew there are idiosyncrasies to poaching salmon. A French technique called court boullion to highlight the ingredient in its purity. Poaching on the stove with other liquids like water, stock or wine or a mix is different. I turned to my social media friends. All, @LDGourmet, @cakeduchess, @koshelikeme, @divathaateny, @MadHungryWoman, @exceptionalfood and @StormsTunesFood unanimously said to immerse the fish COMPLETELY in a good quality, extra virgin, olive oil. Cooking method should be low and slow and the general consensus was to toss the olive oil away after the poaching process was done. One friend suggested to keep the oil. "It's an instant oil and omega 3 supplement" he said, which made sense, but I was too worried about the oil spoiling, even in the fridge to attempt it. You can follow the conversations here, here and here. The oil engulfing the fish rises above any other liquid that is present. It locks in the moisture and keeps the fish from drying out. I found out an internal temperature of 140F-180F is ideal for a delicately flaky consistency. I had my oven at 250F but I didn't check the internal temperature of the fish with a thermometer. The fat content makes a difference too. I happened to choose Coho salmon which is lower in fat content than say Sockeye or farmed salmon so it will cook and dry out faster. Thickness of the fish varies cooking time as well. I kept it in the preheated 250F oven for 40 minutes. It was still moist but I suspect that even at 30 minutes it would be fully cooked and beautifully moist and flaky. Just test it with a fork. The lemon dill aioli is such a classic and by far my all time favorite aioli. I really delight in it. I suspect if I slathered it on the fish and served it to my family, they would possibly be converts, just like me. Visit my Rosh HaShanah Favorite Recipes Recap for other holiday menu ideas. Mix all ingredients well with a fork, for about a minute, until a smooth consistency is achieved. Adjust lemon, salt according to your taste and keep in a jar, refrigerated until serving. The aioli can be prepped a day or two ahead. Preheat oven to 250F. Wash the fish under cold water and pat dry with paper towels. In a heat resistant oven serving dish lay the fish skin down, squeeze lemon juice on top, salt it lightly, cover with olive oil and toss the capers on top. Cook for 30-40 minutes or until flaky and moist when forked. No pinkish rare salmon bits present. Take out of the oven and let cool to room temperature. Remove any capers off the top of the fish and overlay and decorate with cucumber scales. Serve immediately or cover and refrigerate until serving. Can be made a day ahead and served cold with lemon dill aioli on the side. 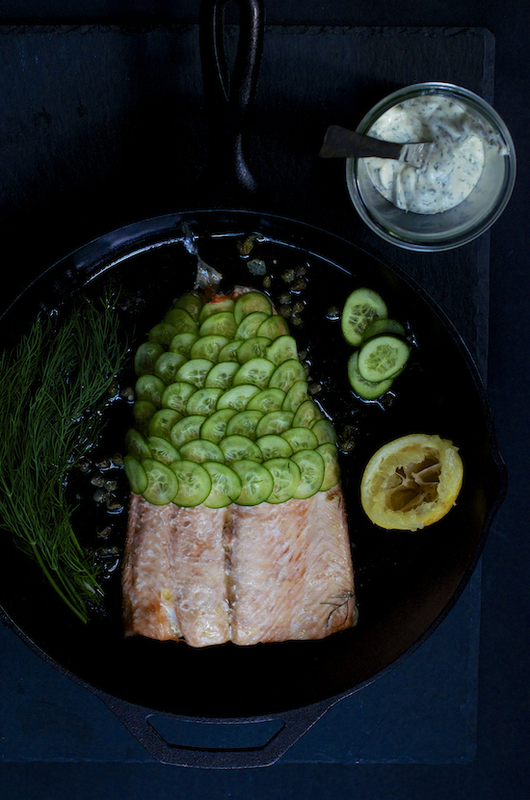 The fish can be decorated with the cucumber scales once cooled and refrigerated overnight. Surprisingly enough it keeps well while moistening the fish. Another method is a stove top poaching as shown here by Fine Cooking. Please share in the comments section below any tips, thoughts and experiences you had with poaching fish. What unexpected beauty to come upon Shulie! Loved the patterns and the two sides. Shulie, this dish is gorgeous. I love the thin slices of cucumber layered on top, so pretty. I have yet to try my hand at poaching fish in olive oil. A foodie friend of mine (also on twitter @dadekian ) has done so, I believe with halibut. Cannot wait to try this recipe out!! It's so pretty and I've never done this either. Now I can't wait to try it. 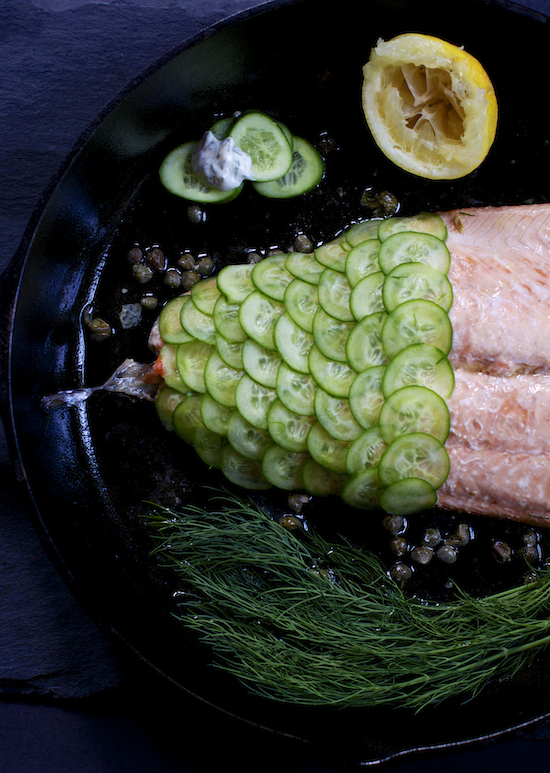 Such a fancy way to dress up salmon. I am with Maureen, can't wait to to try this out.. Such a fancy way to dress up Salmon. I agree with Maureen, can't wait to try this one out. Beautiful! That is one of my favorite fish dishes. TY & Oohh good to know, Rosa. wow I went to the market earlier and got dill and I thought to myself "I wish I could buy some salmon too". Since that I am craving salmon and now that I saw your poached fish I am really getting a massive appetite here. Classic aioli maybe, but I needed that today. Great timing Shulie! Gorgeous Shulie! What a great idea to use those cucumbers as scales. Pinned. Me too. All I order is salmon sushi. & vegetarian versions too. :) Thx for the poaching conversation Lora. Stunning presentation, I love the lemon dill aioli! Lovely, Shulie. This really lets the flavors shine. שולי - זה נראה מדהים!! זה לא בשבילי (אני צמחונית) אבל אי אפשר שלא להתפעל מהמנה הזאת. I usually bake salmon, first with a brushing of olive oil and then place lemon slices across the top. My family would be very happy if I tried poaching in olive oil! 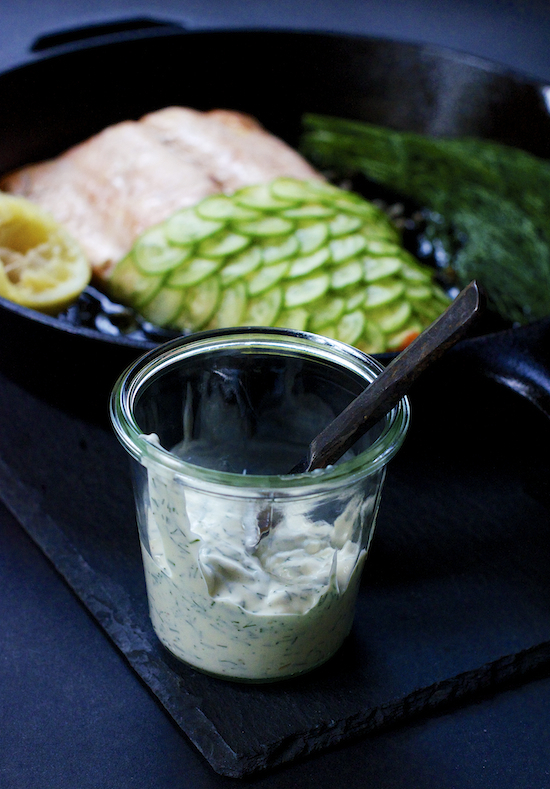 The presentation with cucumber slices and lemon dill aioli is just beguiling! LOL...picturing your family hauling you to an asylum due to anemic salmon! It sounds simply amazing to me...and so elegant with its cucumber scales. I may have to try poaching in olive oil...I love, love salmon!!! ahahah Liz, thanks for reading. It sounds even funnier the way you put it. lol Me too, I love salmon the elegance comes in a snap. Super easy fancy! I have never poached salmon before - love your combo of capers and lemon! 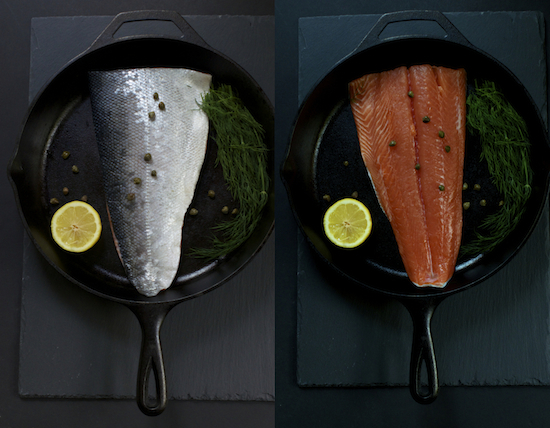 i don't eat fish but love the photography ! I've never oil poached fish but your beautiful dish makes me want to try it. It's so beautifully presented with the shingled cucumber slices! This is absolutely gorgeous, I love the photos and presentation! And salmon is always a favourite of mine. Yes! Poaching is one of my absolute favorite ways to cook fish--it's super easy, and the results are so succulent. This is nothing less than a work of art --- fantastic!